A top-of-the-line finish that is high gloss, it is perfect for beautifying and protecting surfaces like metal, wood and masonry. Long-lasting protection now comes in a beautiful, glossy avatar. 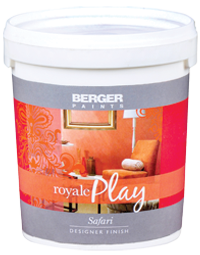 A high quality, multi-purpose finish, Royale Enamel High Gloss is based on a suitably modified alkyd with titanium dioxide and other high grade, colour fast pigments. Its excellent flow and build-up gives the surface a truly luxuriant finish. Royale Enamel High Gloss is versatile and can be easily used for application on interior and exterior metal, wood or masonry surfaces. Steel: Remove rust by sand blasting. Apply one coat of Berger Luxaprime. 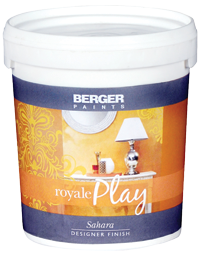 Wood: Clean, sand and treat with Berger Wood Primer. 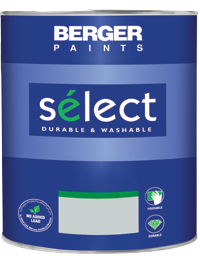 Masonry: Clean thoroughly and apply Berger Primer Sealer. Application procedure Steel: After priming the metal, apply two coats of Royale High Gloss Enamel with adequate time between coats. Wood: Apply two coats of Berger Stucco, followed by two coats of Royale High Gloss Enamel. 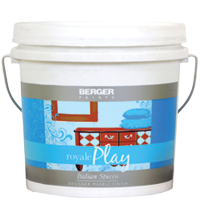 Masonry: Apply two coats of Berger Stucco (only for interiors) and two coats of Royale High Gloss Enamel. 1The paint on my walls has started to crack and peel off. Why does this happen? A multi-tasking finish for multiple surfaces and applications, with ultra-fast drying time and durable good looks.